Africa and particularly, Nigeria's drones, robotics and technology industry is expanding across all industries, including mining, agriculture, security, telecommunications, emergency response, wildlife protection, search and rescue and more! Meanwhile, Science, Technology, Engineering & Math (STEM) education has been very neglected by both government and private sector in this part of the World. Exodus Int'l Aviation Academy, EIAA hereby proudly hosts the first and maiden edition of the annual Drone and Technology Conference & Expo in Africa, with over 40 speakers and an exciting offering of exhibitors, techno-preneurs, presenting the perfect platform to learn from and network with high tech, robotics, IT, mechatronics, drone manufacturers, suppliers, distributors and professionals, as well as offering live drone demonstrations, drone building workshops, conference and expo. AfDRATE is the place to be for all drone enthusiasts, learners and tech professionals. There will be live flying demonstrations in the exhibition area where you will see the flying machines in action! 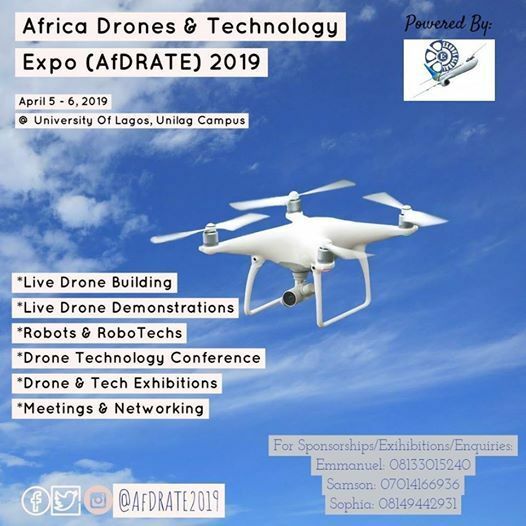 Book your ticket now to secure your spot and join us for the maiden edition of this Drone and STEM Educational Conference & Expo.